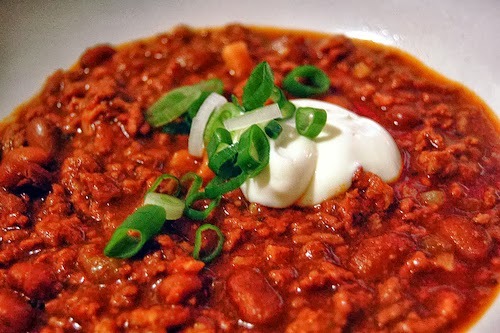 A bowl of chilli is an all-time favourite of mine, especially now that I've been building up my chilli tolerance lately (I can actually have it quite hot now!). This recipe makes a great dish to serve with rice or I love using it as my filling for burritos and tacos. You could also have it on toast if you're one of 'those' people. Fry off your onion and beef until browned. Add the spices and fry until fragrant. Add the tomatoes, wine and stock and simmer for half an hour. Add in the kidney beans and simmer for a further 10-15 minutes or until it is a good consistency (it shouldn't be runny). By now you're home should be smelling like a true Mexican kitchen so take the pan off the heat and serve with your rice or in your burritos. This chilli con carne recipe is a guaranteed flavour sensation. Serves 4-6.